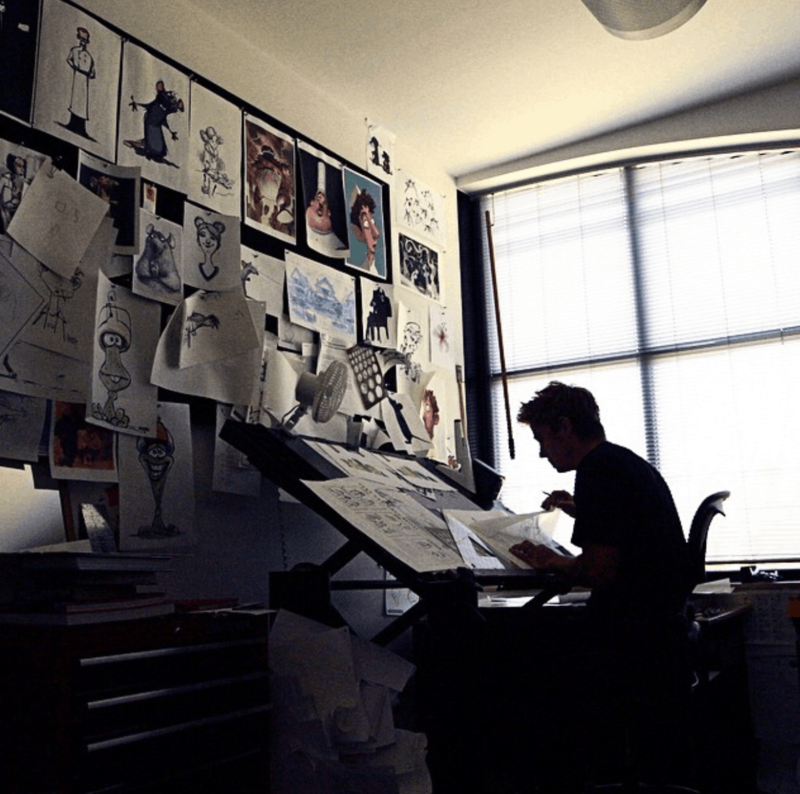 I love seeing people’s workspace. 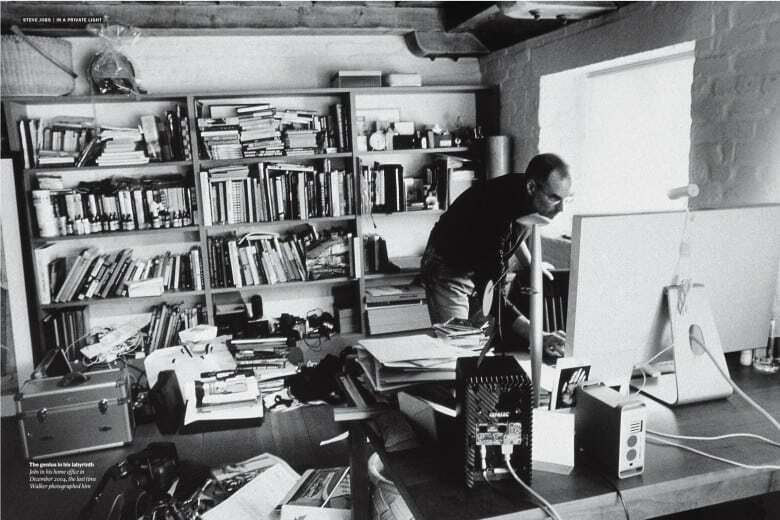 I think it reveals a lot about them and has enamored me ever since I saw this photo of Steve Jobs in his home (photo by Diana Walker. I think it originally appeared in Time). I just love that he had a bunch of computers sitting on the floor, stacks of paper sitting around, and lots of books. It doesn’t seem at all unlike my office today. What’s interesting to me is while I outwardly love and prefer a clean workspace, I don’t have one. Neither did Jobs. Things just land on my desk too quickly and need to stay top-of-mind or else I know I’m going to forget about them. So when I ran across this gem from Getty of Kurt Vonnegut writing at his typewriter, I had to share it here and plunk it in my gallery of workspaces. I awake at 5:30, work until 8:00, eat breakfast at home, work until 10:00, walk a few blocks into town, do errands, go to the nearby municipal swimming pool, which I have all to myself, and swim for half an hour, return home at 11:45, read the mail, eat lunch at noon. In the afternoon I do schoolwork, either teach or prepare. When I get home from school at about 5:30, I numb my twanging intellect with several belts of Scotch and water ($5.00/fifth at the State Liquor store, the only liquor store in town. There are loads of bars, though. ), cook supper, read and listen to jazz (lots of good music on the radio here), slip off to sleep at ten. I do push ups and sit ups all the time, and feel as though I am getting lean and sinewy, but maybe not. Discard the Program when you feel like it — but go back to it next day. Concentrate. Narrow down. Exclude. Tolstoy reportedly worked in isolation. No one was allowed to enter his study, the doors were always locked, and he removed interruptions. His routine was simple: he would go to the study in the morning after a hearty breakfast and stay there until dinner at about 5:00. 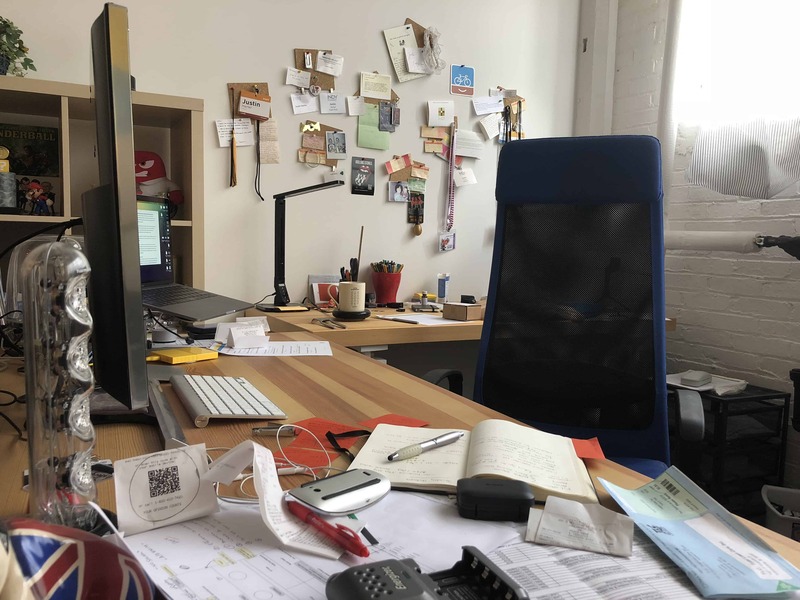 Since he skipped lunch, and since his family would not venture near the study – they would blow a horn if they needed him – he could usually work uninterruptedly for several hours. He rose at 7:00, had breakfast at 8:00, and was in his study by 9:00. He stayed there until 2:00, taking a brief break for lunch with his family, during which he often seemed to be in a trance, eating mechanically and barely speaking a word before hurrying back to his desk. On an ordinary day he could complete about two thousand words in this way, but during a flight of imagination he sometimes managed twice that amount. Other days, however, he would hardly write anything; nevertheless, he stuck to his work hours without fail, doodling and staring out the window to pass the time. Promptly at 2:00, Dickens left his desk for a vigorous three-hour walk through the countryside or the streets of London, continuing to think of his story and, as he described it, “searching for some pictures I wanted to build upon.” Returning home, his brother-in-law remembered, “he looked the personification of energy, which seemed to ooze from every pore as from some hidden reservoir.” Dickens’s nights, however, were relaxed: he dined at 6:00, then spent the evening with family or friends before retiring at midnight. All of these people had something in common: they did things even when they didn’t want to, they isolated themselves, they focused on one thing, and everyone knew not to disturb them or their process. They built their lives to set them up for success in their creative endeavors. In other words, you can’t do anything useful for anyone if all you do is clack away at emails and text messages all day. My routine has a similar cadence: I wake up at 5 or 5:30, usually without much or any help from the alarm. I cook a breakfast of one sausage patty, two strips of bacon, two eggs over-medium until they’re just not runny anymore, and 5-6 strawberries with a glass of iced tea. While eating I review some of my more urgent-looking emails and news. I’m out the door on my bike by 6, at the office by 6:30, and drinking a cup of coffee by 7. I start by writing posts for clients or doing design work. I prefer to work uninterupted until 10:30 by leaving my phone and emails off. I walk for lunch at 11, come back and tackle administrative tasks and typically schedule phone calls for after lunch. I’m out the door by 3:45 for a workout at 4, bike back home at 5:15, and then it’s time for a shower, dinner, and more personal writing for the evening. If only I could see the same success as Vonnegut or Jobs.